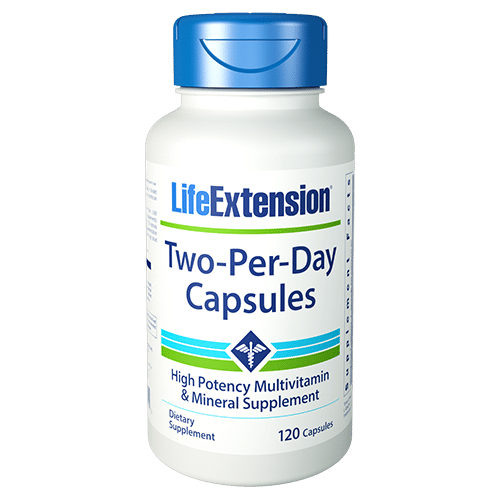 Life Extension’s Two Per Day multivitamins have the highest nutritional potencies of any science-based multivitamin formula that can fit inside two capsules or Capsules. This gives you far more of the essential vitamins, minerals and health-promoting nutrients than typical store-bought formulas, and it does so at a very economical price. Why is this so important? While Recommended Daily Allowances (RDAs) were developed by the government, they only provide the minimal doses to protect you from deficiency. Research studies demonstrate that unless you’re taking the ideal dose of vitamins and minerals, you won’t fully receive their benefits for optimal health and well-being. 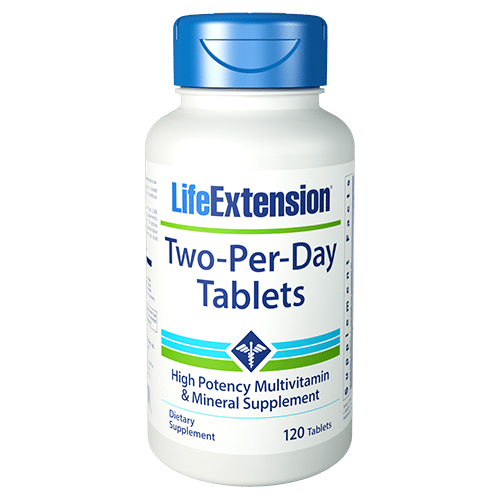 Two-Per-Day now contains three potent forms of selenium (SelenoExcell®, Se-methyl-selenocysteine, and sodium selenite). Also newly included is apigenin, a powerful bioflavonoid found in many vegetables and fruits which boosts cell protection. Two-Per-Day Capsules provide Crominex® 3+, a highly stable and biologically active form of chromium blended with Capros® Amla and PrimaVie® Shilajit.9 When used as part of a healthy diet, chromium plays a vital role in maintaining healthy blood sugar levels in those within normal range. The current RDA is only 600 IU. As a result of startling evidence of a widespread vitamin D deficiency, prominent nutritional scientists are calling on Americans to increase their vitamin D intake to 1,000 IU per day and higher. Vitamin D in the amount of 2,000 IU is contained in the super-potent Two-Per-Day Capsules. B Vitamins : there’s more than one “vitamin B.” Your body uses B vitamins plus enzymes to release energy stored in carbohydrates, fat, and protein – energy which is needed by your cells. 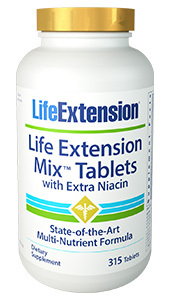 Life Extension Two-Per-Days contain bioactive forms of vitamin B2, vitamin B6, and more. 5-MTHF : Life Extension’s Two-Per-Day contains 5-methyltetrahydrofolate (5-MTHF), the active form of folate that is up to 7 times more bioavailable than folic acid. This greater bioavailability is especially important in people with a genetic enzyme deficiency since it requires no conversion to become metabolically active. A multivitamin is not complete without providing all of the minerals and a few antioxidants essential to healthy living. 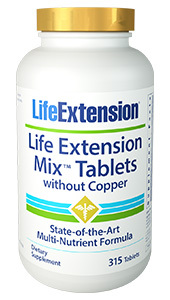 Life Extension’s Two-Per-Day Capsules provide 10 times more biotin and 4 times more selenium than Centrum® Silver® Adults 50+. Alpha-lipoic acid : Alpha-lipoic acid promotes liver health, nerve health, and more. Plus, this universal antioxidant helps boost glutathione levels already in normal range. It is also packed with nutrients like zinc citrate and natural mixed tocopherols for superior absorption and bioavailability. 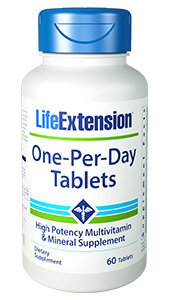 So start supplementing with the best multivitamin you can buy, choose Life Extension Two-Per-Day multivitamins. Other ingredients: vegetable cellulose (capsule), vegetable stearate, rice flour, microcrystalline cellulose, silica, maltodextrin, chlorophyllin. L-OptiZinc® is a registered trademark of InterHealth Nutritionals, Inc.